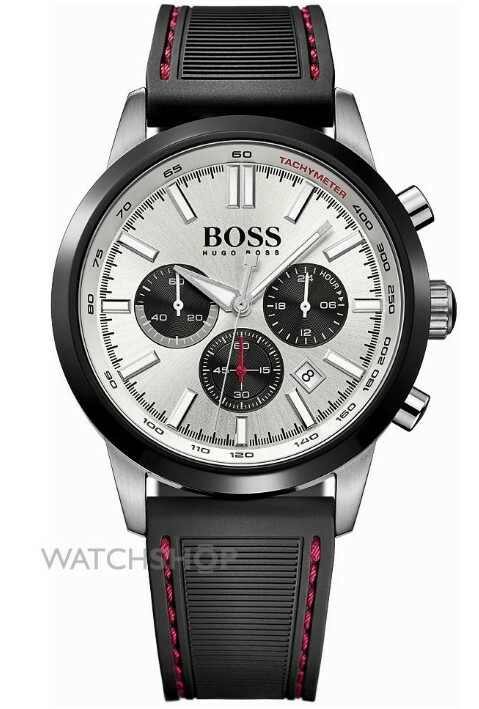 Combining style and elegance, the heavyweight fashion brand that is Hugo Boss always delivers when it comes to the latest watch trends. Its ongoing sponsorship of the GQ Men of the Year Awards means its timepieces are given to winners and award presenters, and so end up on the wrists of some of the best-dressed men and women in showbiz. Constructed from premium materials, and spanning classic, contemporary and sport models, Hugo Boss collections always go down well when they arrive here at Watch Shop. 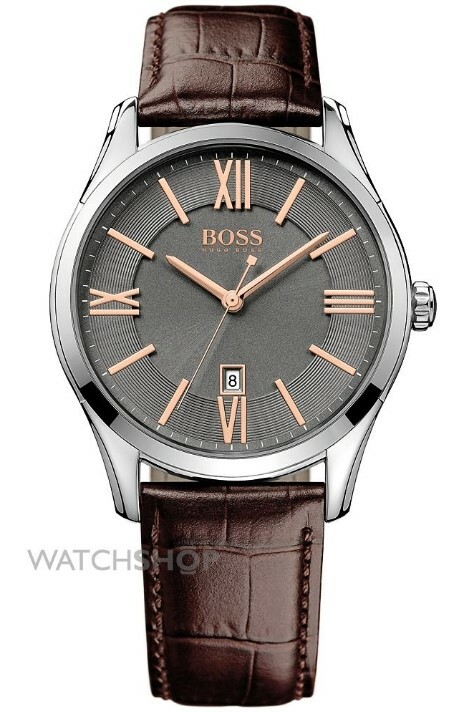 If you're looking for versatility, then this handsome Hugo Boss Men's Ambassador Watch could be for you. Its chocolate brown, tortoise-shell leather strap makes it classic enough to be your go-to dress watch, but the contemporary detailing on the oversized face mean it's suited to casual or professional settings too. Exclusive to Watch Shop, this Hugo Boss Men's Ambassador Chronograph mixes timeless design with modern elegance, making it ideal for special occasions or business-wear. 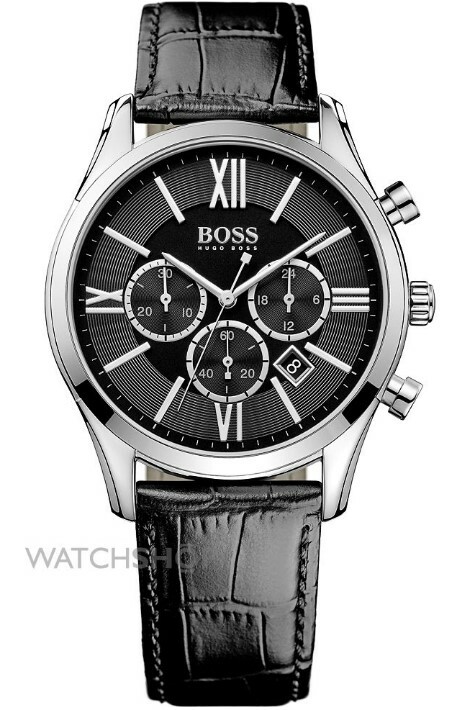 The large face features silver Roman numerals and the iconic Boss logo, and includes the time, date and chronograph, which runs on quartz movement. The stainless-steel case is finished in a high-shine silver, which is complemented by the sleek black leather tortoise-shell strap. Like what you see? Watch Shop is the only place to buy it. This striking number from the Hugo Boss Ladies Classic Sport collection is a fine example of a smart-casual watch that can be paired with numerous looks. The PVD gold plated casing gives the piece a luxurious aesthetic, which is carried on through to the face in a lighter, matt-finish gold. The watch also has a built-in chronograph, which can be monitored using one of the three totalisers found within the face. 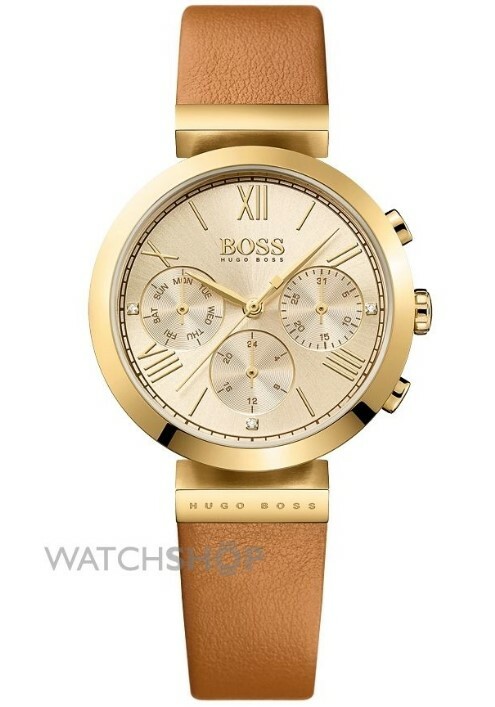 The subtle use of the Hugo Boss logo lettering outside the casing beneath the 6 o'clock position leads on to the slim, tan leather strap, completing one of the season's prettiest watches. In terms of minimalism, watches don't come much more fuss-free than this Hugo Boss Men's Ambassador Special Edition Ceramic model. Proving that less really is more, the oil-slick black aesthetic is ultra-modern â the ideal accessory for the man that likes to keep ahead in the style stakes. Using charcoal grey sparingly for the second and minute markers, the serious face is nicely finished with a silver Boss logo and matching hand. It's a limited-edition piece that looks so good it would be a shame if it only ended up on the wrists of collectors. This sporty Men's Hugo Boss Chronograph is packed with masculine character, and comes loaded with some nifty fitness features to boot. The attractive silver face incorporates a stopwatch and a handy tachymeter around the bezel â which can help you measure distance travelled or speed, with a little bit of additional maths. The face is nicely framed by a polished black casing with stainless steel silver dials, and completed with a tough rubber strap, making this an ideal choice for the active sportsman. 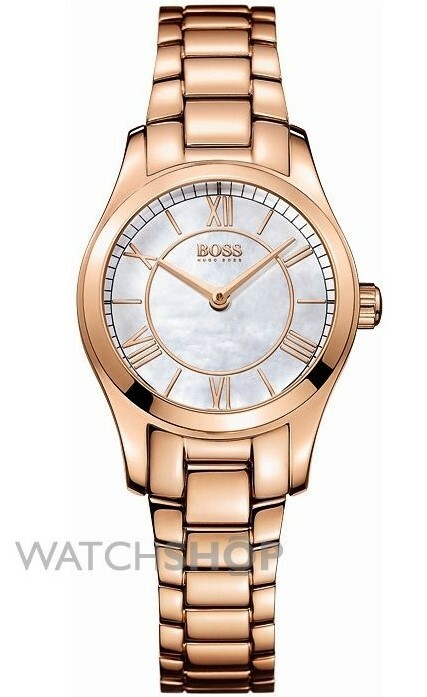 This pretty Ladies Hugo Boss Rose Watch is a real head-turner, thanks to its shimmering white mother of pearl face and dial, which is contrasted beautifully with rose hands and markers. The watch is powered by quartz movement and fastens with an ornate, rose metal bracelet. Versatile enough to wear at work, its good looks and petite size also make it the perfect accessory for a cocktail dress. 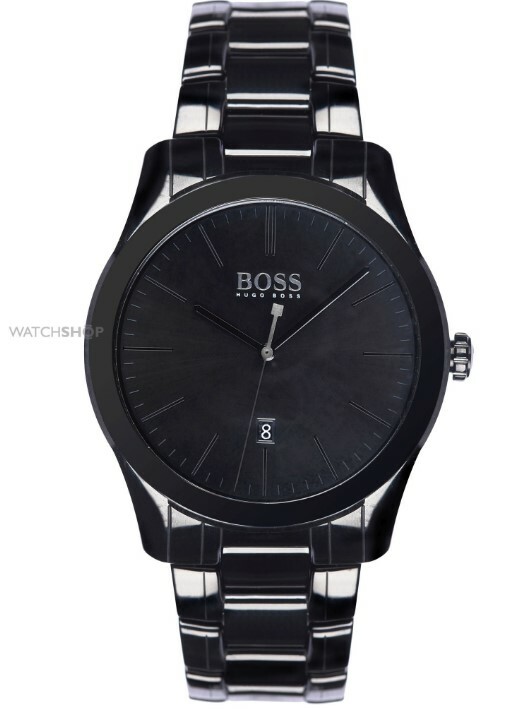 Have you found your perfect Hugo Boss watch? If you're looking for further inspiration, take a look at our entire Hugo Boss collection, which includes over 100 watches as well as jewellery and gift sets, or discover our men and women's Christmas gift guides.